Welcome to Haven, the last city not corrupted by the influence of intergalactic beings known as The Others. The beings take the form of the Seven Deadly Sins. As an agent of F.A.I.T.H. (Federal Authority for the Interdiction of Transdimensional Horrors) you will be sent on various missions to keep Haven Sin free. Will you fall to corruption or will you rise to the challenge as saviors of the city? The Others: 7 Sins is a one vs. all board game in the same vein as Descent: Journeys in the Dark, and Star Wars: Imperial Assault. One player takes control of the forces of one of the Sins. 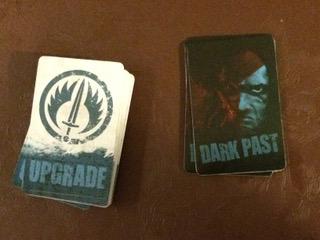 The base game comes with the sins of Pride and Sloth, with the other five Sins available as expansions. The rest of the players take control of one of the heroes of F.A.I.T.H. Each hero has a unique ability to help them combat the Sins player. One such hero is Karl who is a werewolf, and can switch between werewolf and human forms depending on the situation. 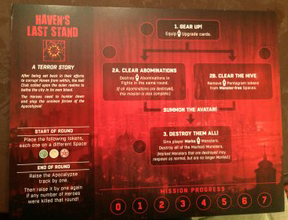 At the beginning of each game the players select a mission to try to accomplish. These missions have three categories: Terror, Corruption, and Redemption. Terror missions are the most straightforward where the heroes must basically kill everything. Corruption missions are based around subterfuge, and introduce the hero characters’ dark pasts that could come back to hurt the heroes. Redemption missions deal with the heroes working to save the citizens of Haven from the corruption of the Sins. The Others is unique in that the Sins player doesn’t get a traditional turn. As the heroes go through their turns the Sins player can use cards to interfere with their turns, as well as tokens to directly attack with a monster they control. Combat is very simple. You fight all the monsters in your space. Monsters are only killed when you roll enough damage, and any damage or corruption you take is negated by defense and anti-corruption results you roll on your dice. How do you destroy that huge nasty Avatar monster? With exploding dice of course! Dice for both the Sins and Hero players have symbols that cause you to roll another die to bring on the pain. 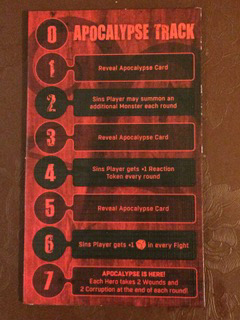 The Sins player becomes stronger depending on the number of monsters in combat, and the hero players have access to upgrade cards and the corruption track. Heroes gain access to more benefits during rolls if they voluntarily take more corruption. The downside of corruption is that if you take too much, you will start taking physical damage. If any hero takes five damage, they die, and they will have to choose a new character from the pool of heroes. If a hero dies and there are no heroes left in the pool, the Sins player wins. 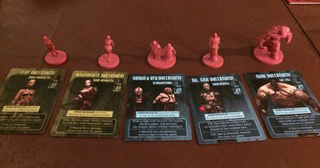 For people who are familiar with the game Zombicide, the actions are almost identical to The Others, so it is very easy to jump in. The game is balanced where whoever takes the role of the Sins player doesn’t have to act as a game master. Each side is balanced where they both have a fair chance of winning. As with any of Cool Mini or Not’s other miniatures-based games, this games with a lot of minis that are very high quality. The Avatar of Pride is massive, and very detailed. If I had any skill with mini painting, I would definitely want to paint them. One problem I have with the game is based more on selection. 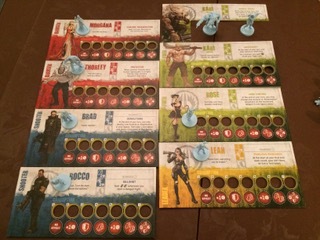 The base game comes with two Sins and a team of heroes, which is enough to play many games, but variety is the spice of life, and unless you backed the game on Kickstarter you will need to buy the other Sins. The same can be said for heroes. The theme is not for everyone, and is certainly not for children. The game’s theme screams horror, but overall it is much more like an action movie. The Others: 7 Sins is a great game with great components, and definitely worth a look.